Bringing a touch of glamour to King's Cross, Anthracite is a sophisticated martini lounge with breathtaking views of George Gilbert Scott's St Pancras clock tower. Located on the first floor of the Great Northern Hotel, the 90-cover cocktail bar is arranged over three rooms. 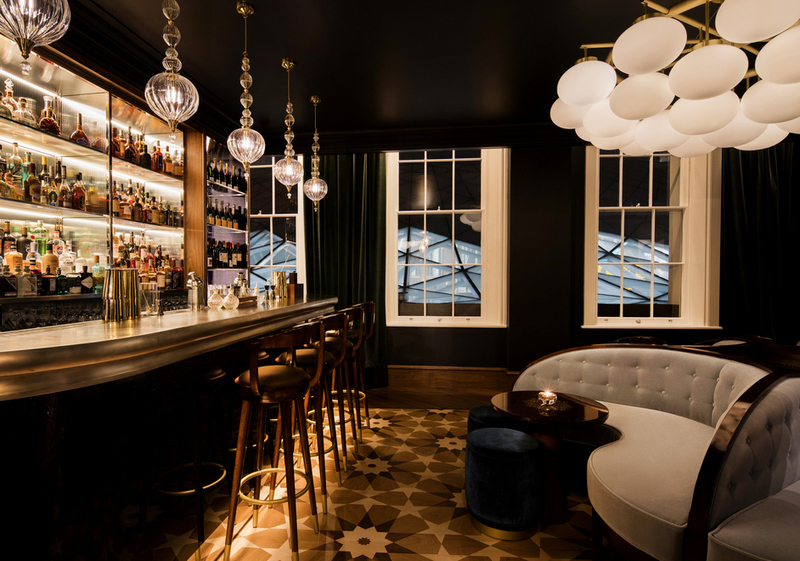 The lounge has been developed by Archer Humphryes - the architects behind the 2013 redesign of the Grade II listed hotel - and takes inspiration from the colour and unusual properties of the coal from which it takes its name. Anthracite used to fuel trains chugging in and out of St Pancras and t he blue flame it burns with is reflected in the lounge's charcoal colour palette and electric blue trims. Portraits by Sky Arts Portrait Artist of the Year 2017, Gareth Reid, line the walls but it's the martinis that are the main talking point. Vodkas, gins and vermouths create a bespoke martini, expertly mixed by head bartender Balazs Nagy and team. Anthracite clubs, bars, cabaret nights, casinos and interesting nightlife. What are the best dining options near Anthracite London? Anthracite gyms, sporting activities, health & beauty and fitness. The best pubs near London Anthracite. Where to have your meeting, conference, exhibition, private dining or training course near Anthracite. From cheap budget hotels to luxury 5 star suites see our special offers for Anthracite hotels, including Hilton London Euston Hotel from 73% off.